It would seem that Tom DeLonge’s program has had some success and I wonder if his status as a member of Blink 182 didn’t provide him with access to some high-level people that the rest of us might not have enjoyed. At any rate, just recently, those he had been working with, and who talked about a sighting along with gun camera film made by Navy fighter pilots, was confirmed by the Pentagon. In fact, we were all told that there had been a secret study made of UFOs for several years, though that study was concluded in 2012. New reports and various commentators told us that the Air Force had begun investigating UFOs in 1947 under the name of Project Blue Book. So, bear with me as we look at a brief history of UFO sightings and investigations. They didn’t begin in 1947 as has been suggested and it didn’t begin with Project Blue Book as claimed. It began during the Second World War with aircrew reports of strange things in the skies around them that became known as the Foo Fighters. The Foo Fighters were thought to be some sort of weapon or aircraft developed by the Axis that could counter the air superiority enjoyed by the Allies. There were discussions at the highest levels of intelligence and Allied command about them. Alleged photograph of the Foo Fighters. One of those involved was an American intelligence officer, Colonel Howard McCoy, who would pop up later. Scientists who made the analysis, which ended with the end of the war, made no identification of the Foo Fighters. The priority ended with the war and it was discovered that the Foo Fighters were not an Axis development. 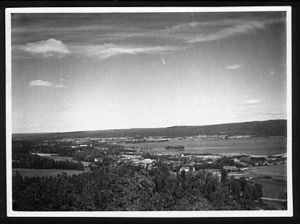 These became unidentified aerial phenomena (UAP). All this was covered in The Government UFO Files that was published a couple of years ago. But sightings didn’t end. In 1946, first in Finland, then Sweden, and finally all of Scandinavia and Europe, people were seeing what they called the Ghost Rockets. These were described more as rockets, some resembling the V-weapons developed by the Nazis, than they were as spaceships. Sightings continued into the late summer until various Scandinavian governments imposed a news blackout and without new stories about the Ghost Rockets published, the sightings seemed to end. A streak of light that was thought to be one of the Ghost Rockets. Today it is believed to be a meteor. The sightings, however, did interest American intelligence. The thinking was that it might be some sort of Soviet development that demonstrated a new technology taken from Germany. Decades later it was learned that the Soviets had made no such development, but that didn’t mean that interest wasn’t high in 1946. 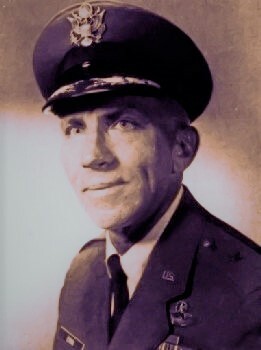 An American intelligence officer, Colonel Howard McCoy, was one of those given the task of identifying the Ghost Rockets. In late 1946, according to research done by Wendy Connors and Michael Hall, McCoy was given orders to establish an unofficial study of these UAPs. He set up an office at Wright Field with locked doors, very limited access and began gathering new reports. One of the best came from the Richmond (Virginia) Weather Station beginning on April 1, 1947. This was a series of sightings that included, according to the tales told, disk-like objects made by several different witnesses. 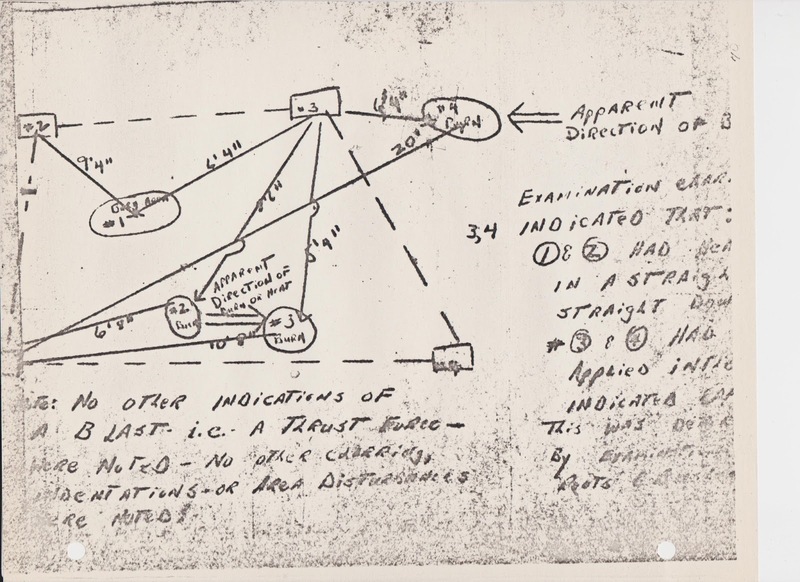 It is important because it demonstrates an interest in these UAPs at the highest level of the military command structure that preceded the Kenneth Arnold sighting of late June 1947. When the Arnold sighting was reported by the national press, the unofficial investigation became official. Investigations of sightings began by military officers, scientists and even FBI agents. In September, Lieutenant General Nathan F. Twining, commanding officer of the Air Materiel Command, issued a letter that suggested the phenomena, that is the UAPs, were something real and not illusionary or fictitious. He ordered the creation of a project to investigate these flying saucers. Contrary to popular opinion, or rather what the news media is reporting today, that was not the beginning of Project Blue Book but of Project Sign. It began official operation in 1948. The officer who wrote the draft of the letter and the recommendations was Colonel Howard McCoy, the man who had been involved with them for years. This demonstrates a link from the Foo Fighters of the Second World War and this new project begun in 1947. In the beginning, the project name, Sign, was classified with the public being told it was Project Saucer. That point will become important later. Many if not most of those involved in Sign believed that there was alien visitation and created an “Estimate of the Situation,” to prove it. Using the best evidence available they assembled the Top Secret document that was sent up the chain of command to General Vandenberg. Vandenberg didn’t believe that the evidence proved the case for flying saucers. The Estimate was ordered declassified and then destroyed. While it might seem backwards, that is to declassify the report and then destroy it, by doing it that way, no record of it was created. In other words, destruction of Top Secret material required documentation to prove the document had been properly destroyed but by declassifying it first, no such documentation was required. This is just another indication that everything about UFOs was not above the board and that there was secrecy involved. Those left at Sign, after a house cleaning that saw those who had written the report removed from the project, eventually issued a final report suggesting that there was nothing to the flying saucers that couldn’t be explained in the mundane. There was nothing more to be done and the impression left was that the Air Force had concluded its study which was something that was announced. In fact, the code name was changed to Project Grudge, and the investigations continued. 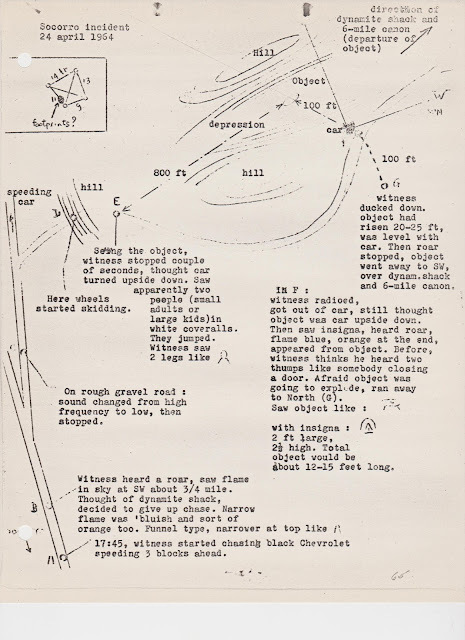 Eventually, Grudge produced a long final report which again suggested that UFOs were explainable even though there was a large body of reported sightings that were not identified. The project was then nearly abandoned with little being done thought it still, technically, existed. Grudge then evolved into Project Blue Book with renewed interest after a series of radar sightings. 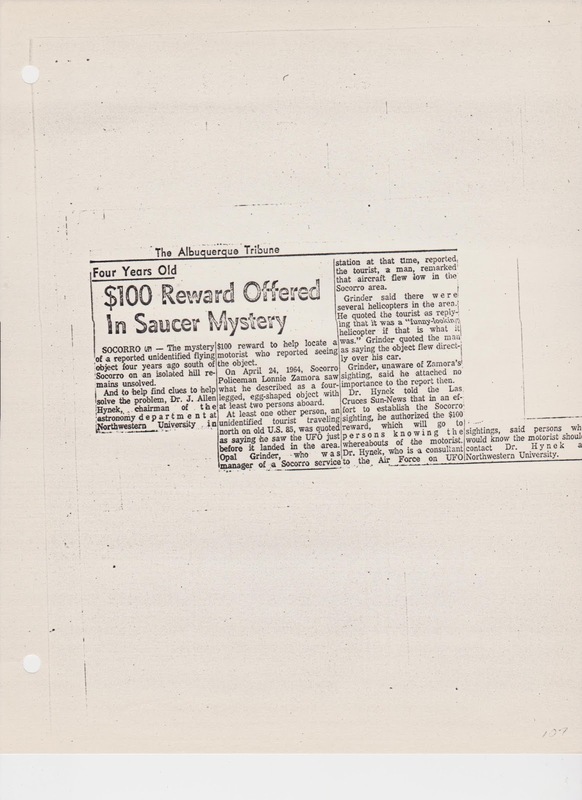 For about 18 months, through the summer of 1952, the effort was in gathering solid information and investigating the sightings in an unbiased manner. But old habits die hard and Blue Book became nothing more than a public relations project with the goal of explaining sightings. Air Force regulations, particularly AFR 80-17 provided for releasing UFO information if the sighting had a plausible explanation but requiring the information to be classified if no explanation had been found. Questions about these unexplained sightings were directed to a higher authority. 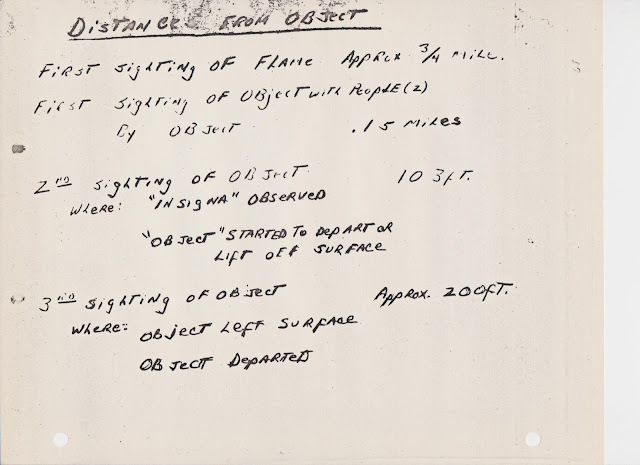 During the 1960s, it is clear from the documentation in the Blue Book administrative files, there was an effort to end the investigation, though it could be suggested it was an effort to end the public face of UFO investigation by the Air Force. 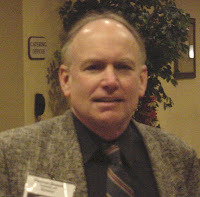 The University of Colorado and Dr. Edward U. Condon, accepted a grant to investigate UFOs. While it was suggested that it was an unbiased investigation, documentation exists proving that it was anything but that. 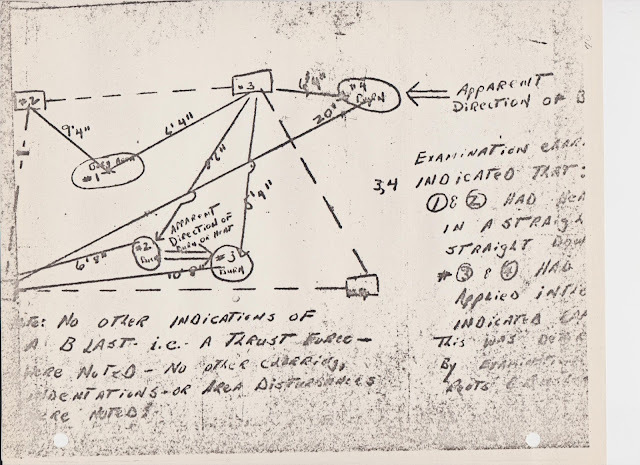 Lieutenant Colonel Robert Hippler provided instructions to Condon that suggested that they find there was no threat to national security, there was nothing to the reports of scientific interest, and the Air Force had done a good job investigating sightings. Condon himself, at a speaking engagement in Corning, New York, told the audience that he was ready to find those things but he wasn’t supposed to do that for another 18 months. In December, 1969, Project Blue Book was closed and there were no UFO investigations sanctioned by the US government, at least according to public knowledge. But what about Moon Dust, you might ask? Did it end in 1969 when Blue Book was closed? The answer is, “No,” and the documentation found through FOIA proved that. Even though many documents about it were in the hands of UFO researchers, in 1985, the Air Force told US Senator Jeff Bingaman that such a project had never existed. Presented with documents from the Department of State, the Air Force amended their response, suggesting that the project had never been used. Based on other documentation, that proved to be untrue as well. It must be noted that the deployment of Moon Dust personnel in a number of cases did not seem to recover anything proving alien visitation but the real point is the project did exist, it did deploy and when asked, the Air Force denied these things. In 1985, Robert Todd, a UFO skeptic, filed a FOIA request asking about the follow-on project to Moon Dust. He was told that the new code name was properly classified and could not be released. In other words, he wasn’t told no such project existed, only that it was classified under a new name. I haven’t mentioned the Robertson Panel of January 1953, which was a CIA project that had its conclusions and probably the final report written before the panel sessions ended. Their recommendation was that there was nothing to the UFO reports and that a program of debunking should be started. For those who wish more detail, I have outlined all this in The Government UFO Files. What all this have to do with Tom DeLonge and the most recent revelation about a secret military study of UFOs you might ask? Well, it shows a long list of deceit at the hands of the military and other governmental agencies. It demonstrates some of the cracks in that secrecy that have long been ignored by the mainstream media because of their distaste for stories of alien visitation. 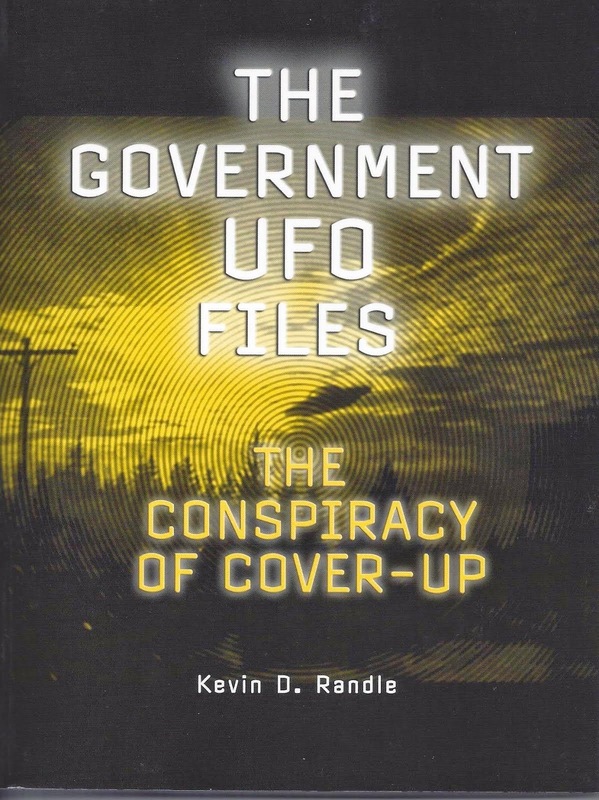 It shows that the government has actually lied about the situation time and again and that while they might have claimed that there were no secret UFO studies or files (just look at what the Condon Committee had to say about that even when access to a specific UFO case was requested, they were told it was classified) that turned out not to be true. What we have learned over the last several days is that much of the 22 million in funding for this new UFO project, landed with Las Vegas based businessman Robert Bigelow. 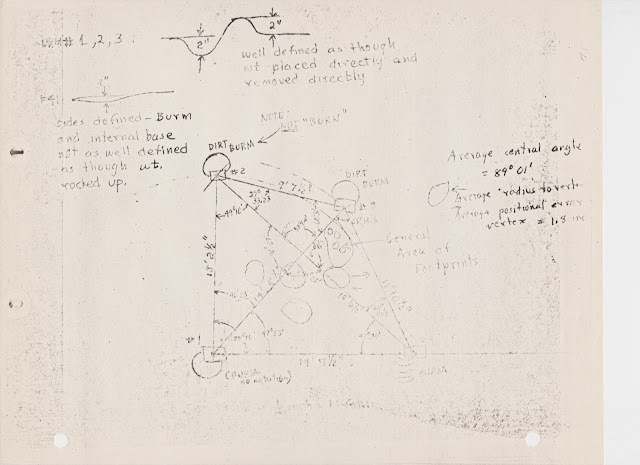 He has been developing a space technology and it seems that he wanted the UFO reports as a way of deducing the propulsion systems being used by the UFOs. That much of the study focused on reports from the military, especially military pilots, indicates that they were looking for something more than just reports of lights in the night sky or strange blobs seen in the daylight. If something could be learned about the dynamics of UFO flight, then progress might be made in developing a system that would duplicate it. It is sort of a back-engineering task (and I use that term advisedly) because it would seem that if they learned something about the exhaust or the maneuvering of the UFO, they might also be able to learn something about the propulsion. But none of that is as important as the implications of all this which is why I spent time explaining the history of UFO research as conducted by the US government and military for about three-quarters of a century. We have seen how the government kept the general public in the dark about those investigations, often saying one thing and doing another. They announced the close of the investigations on several occasions but kept right on working. They said there was nothing to the reports, yet kept gathering and classifying those that couldn’t be explained while announcing solutions to the others. The denied the classified studies and as we have seen, there were those studies made. And, they engaged in a program of ridiculing those who claimed to see UFOs, often suggesting they were uneducated people who might have had a drinking problem when the truth was that the higher the education, the less likely it was for the sighting to be a misidentification of a mundane object. Now we learn, through Tom DeLonge’s organization and some of those supporting him who were, at one time, highly-placed individuals, that another, multi-million-dollar study was undertaken, the funding hidden in the black budget. But what seems to have been missed in all this was that if all the research conducted in the past proved there was no alien visitation, as we have been told, and if there was nothing hidden by various government agencies or in their files who had studied UFOs for decades, then why did we waste 22 million dollars on an investigation that was sure to fail? If the evidence was really as poor as we have been told, and if there was nothing to suggest otherwise, was this money a gift to Bigelow and his corporation and others who were involved? If there was nothing to find, then what was the real purpose of all this? I had one other thought that probably thrills Steve Bassett and the Disclosure crowd, which I don’t think that anyone has mentioned. This is actually the first time that the government admitted there was something to this idea of alien visitation and had spent so much money so quickly on an attempt to learn more. It was the first time that they actually, almost, endorsed a sighting report of an attempted intercept by American military aircraft without providing some ridiculous explanation such as those offered for a variety of credible reports. It might suggest the first cracks in the stone wall of denial that we have been subjected to since many of us became interested in UFOs. What this latest revelation suggests is a subtle change in attitude. There was no denial by the military or the government and the main stream media seemed to take the announcement as somewhat important. Rather than treat the news with the disdain they normally show for UFO related stories, they seemed to be interested in it. That they don’t know much about the whole of UFOs, and can’t seemed to be bothered to even look it up at Wikipedia, they did treat it seriously. So, does this indicate a relaxation of the curtain of ridicule? Does it suggest that more information about UFOs might be coming? Are we being told that something of a scientific value might be learned by studying UFO reports, even if that doesn’t lead us to alien visitation? Those are the questions that need to be answered. There is one other thing that I should note here. Those at the highest levels were looking at this as a way of learning something about the propulsion used by the UFOs. That indicates that they know more about it than they are letting on because if that wasn’t the case, then it was nearly a crime to spend 22 million dollars on a study they had to know what fail. The only way this makes any sense is if they believed that such a study would produce results and the only way they could believe that was if they suspected that some UFO sightings might be of advanced technical craft. The only way any of this makes sense is if they know something about UFOs that they haven’t told us. And that is the real revelation. There have been questions raised about aspects of this case that are buried in documentation that can be found in many locations. Given the questions about Mary Mayes and the "fused sand," I thought I would publish some of that documentation to prove its existence and let others bring their own interpretations to it. First up is from The A.P.R.0. 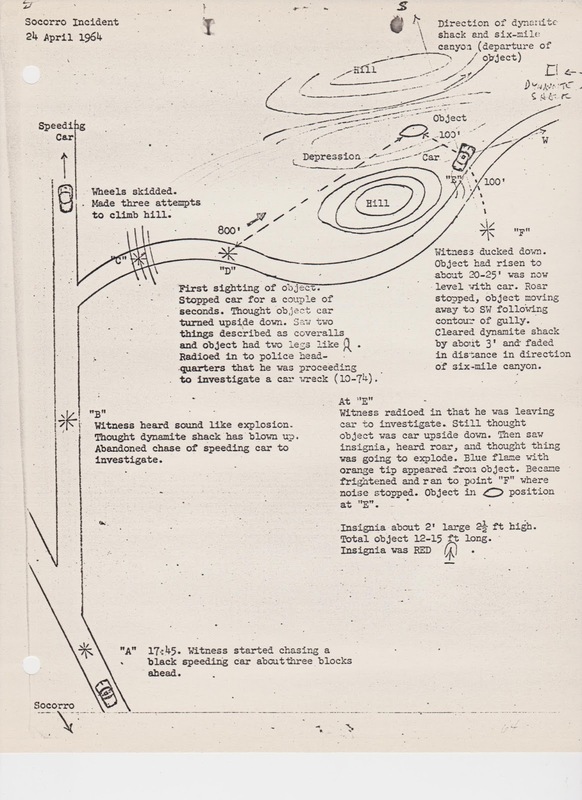 Bulletin of May, 1964, and provides one of the hints about how extensive the search of the landing site was on the first night. Next up is a letter from Charles Moore to James McDonald about what was found on the night of the landing. This addresses some of the issues about Mary Mayes, but also shows that others were there before her and none of them saw the fused sand that she mentioned to Stan Friedman. 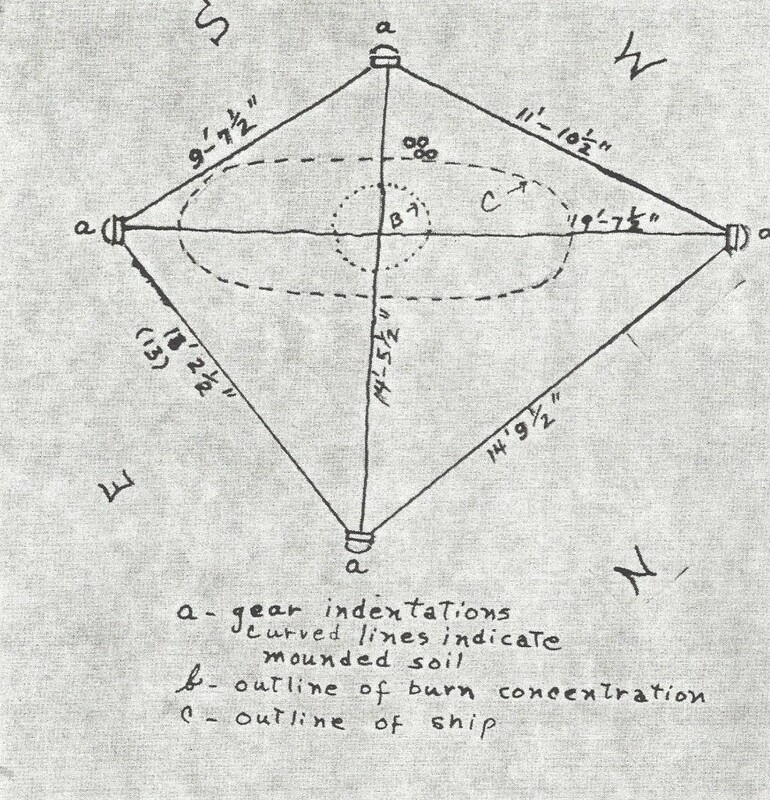 It also provides some commentary on the soil analysis, though the comments are not very extensive. And here is page two, which might be more relevant. Please note the name of another who visited the site on the evening of April 24, and who made a careful examination of the landing area. 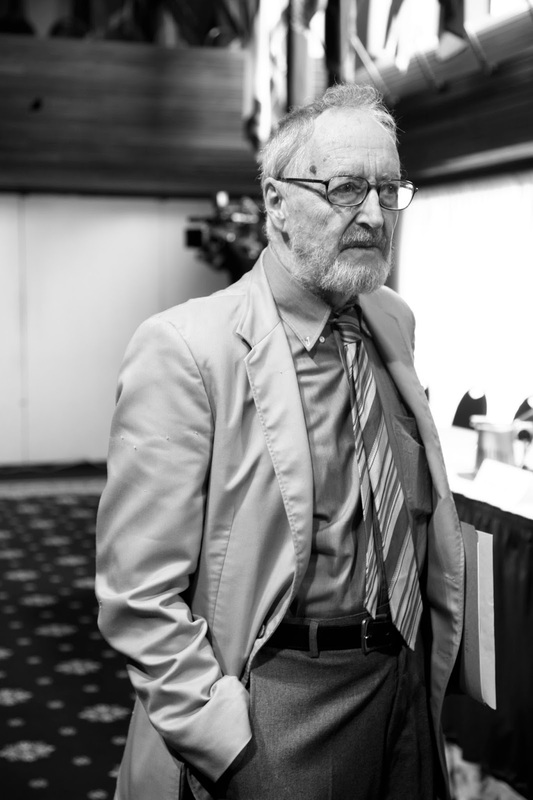 While the information is from Charles Moore, it does reflect what he had been told by John Reiche about his examination of the site. It also provides more information about the search for the fused sand. 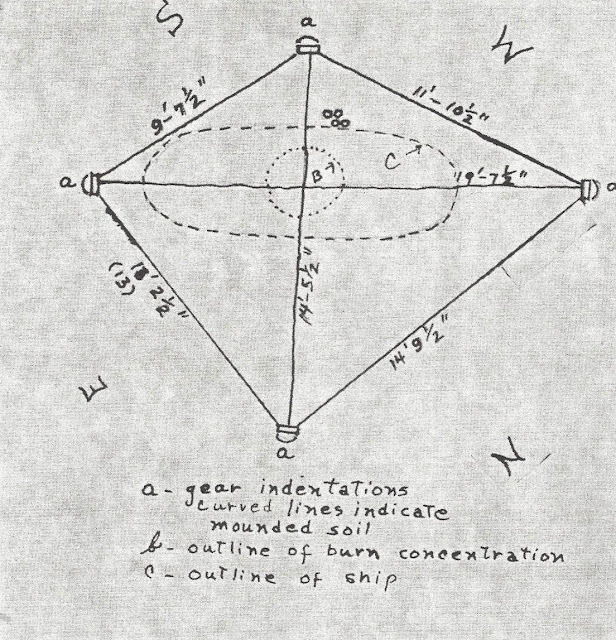 Soil samples collected by Captain Richard Holder were turned over to Dr. J. Allen Hynek for analysis. The Air Force provided information about that, though it was not very comprehensive. Finally, in what might explain why Mayes would have told the tale to Friedman, there is this newspaper article. This is, of course, speculation on my part, but when I saw the clipping, I thought immediately of motivation for inventing a tale. Granted, it is speculation, but it is the first document that I have seen that addresses the issue. 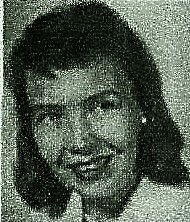 This is from an Albuquerque newspaper and it has been suggested that Mayes was a student in Albuquerque at one time. She could have seen the article, but I freely admitted that this is a stretch. I just thought I would mention it. If I find other documents that seem relevant to the case, I'll publish them here. I will note that each of these documents is protected by copyright. I had planned on this being just a note attached in the comments, but there was too much information and I thought the illustrations were important to understanding this aspect of the case. 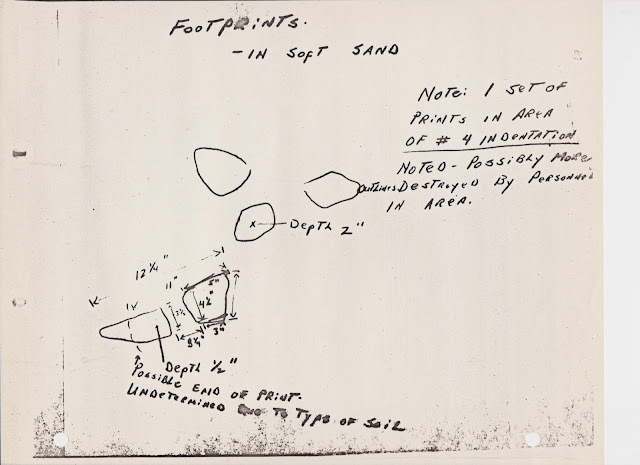 There is absolutely no evidence that Mary Mayes found the fused sand at the landing site. I have been back over the 400 pages of Blue Book files (both the official files and the unofficial briefing files) and the evidence shows that there was no fused sand seen or recovered by anyone other than the claim of Mayes. What we have there is an illustration that located for us, where the various burns were found, including an apparent direction of the heat. What was not listed on this was anything about fused or melted sand. It is clear that a careful examination of the site was made by Holder and others prior to J. Allen Hynek and Ray Stanford arriving a couple of days later. These are the illustrations. This should be enough to convince most people that no sign of the fused sand had been found during the initial investigations and that the site had been carefully searched on April 24. This was prior to Mary Mayes arriving sometime the next day, though we don’t know what time she arrived or how she found the landing site without communicating with one of the principals in the case such as Lonnie Zamora, Sam Chavez, Richard Holder or Arthur Byrnes. The other, almost unacknowledged problem with the Mayes’ tale, is that there is no evidence in support of it other than Mayes’ own, well, tale. She said she was there the next day, but there is no testimony to support that. She said that she found an area of fused sand but no one else reported it, and we do have the testimony of several of those on the site who refute that. They examined the area carefully, according to the documents available, looking for just that sort of thing, but didn’t see it. She said that she examined the fused sand but unnamed officers came and took it all away. She has no evidence to support that. Charles Moore, on learning about the fused sand from James McDonald, went to the landing site and carefully searched it again, looking for signs of high heat. It seems highly unlikely that had high heat been applied to the area that there would be a single area of fused sand and that Mayes would have been able to gather every scrap to suggest that high heat. Moore, who actually had his own UFO sighting in 1949 that was carried as an unidentified in the Project Blue Book files, would not be inclined to lie about this. It does seem that Mayes was familiar with the area, it does seem that she was attending college in Albuquerque, and that family members, or rather one, had gone to school in Socorro. She gave Sam Chavez and Raymond Senn as references but neither said they knew her. Don provided some evidence that Mayes’ family (Rumpf) did know Senn but we have to compare that with what was said. Both denied that they knew her. This seemed to be more of the unconfirmed information that dot this case. We have those pesky three people (or rather the three telephone calls) to the Socorro police about the flame in the sky as noted by Captain Richard Holder. We have the car of tourists talking to Opal Grinder about low-flying aircraft that nearly smashed into them. We have the auditory witnesses, mentioned by Ray Stanford, who heard the roar of the object but who apparently didn’t see an object and whose names have been lost. Given all that, and the fact that this information, about the fused sand was not very well documented, I reported what I knew and let it go. One last point: Have you ever heard of any reports that there was a patch of “fused sand” near the site of the Socorro landing? As a result of a remark that Hank Kalapaca made to me at lunch in the Rayburn building on 7/29 [I will assume here the year was 1968], I followed up a lead that Stan Friedman picked up when he spoke to a nuclear society in Las Vegas. I’m still in the process of checking it, so won’t elaborate the details here. 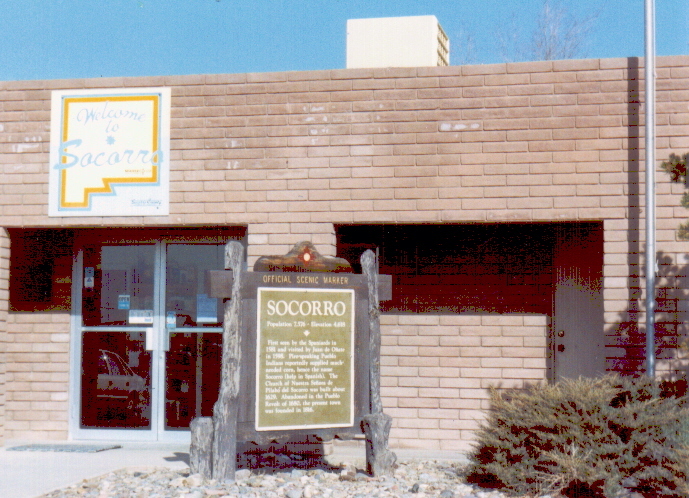 Briefly, a woman who is now a radiological chemist with the Public Health Service in Las Vegas was involved in some special analyses of materials collected at the Socorro site, and when she was there, the morning after, she claims that there was a patch of melted and resolidified sand right under the landing area. I have talked to her both by telephone and in person here in Tucson recently, and am asking Charlie Moore to do some further checking. I must say, it’s very hard to imagine how such material could have been there not only on the evening of the 24th but still there on the morning of the 25th without it ever having been reported before. She mentioned it to Stan rather casually, as if she assumed that everybody knew about the fused sand. She was surprised to be told, especially by me, that nothing like that had ever before been reports. She did the analyses on the plant-fluids exuded from the stems of greasewood and mesquite that had been scorched. She said there were a few organic materials they couldn’t identify, but most of the stuff that had come out through the cracks and blisters in the stems were just saps from the phloem and xylem. Shortly after she finished the work, Air Force personnel came and took all her notes and materials and told her she wasn’t to talk about it anymore. Grand coverup? Not necessarily. The fused sand might be another matter. By comparing the two reports, that is, what McDonald actually wrote with what Stanford provided, you can see that this information isn’t quite as strong as Stanford suggested. In fact, McDonald didn’t seem to be particularly impressed with it, but he did what all good researchers would do. He decided to see what he could learn about the witness, who isn’t named here but whose name appears in other correspondence written by McDonald, and to see if he could find additional information. The next question was if this Mary Mayes’ name could be verified since it wasn’t mentioned in the original letter. On November 25, 1968, Charles Moore (yes, that Charles Moore) reported that he had talked with both Raymond Senn and Sam Chavez about the melted sand. Neither of them saw any melted sand on the site and neither remembered Mayes, though in his letter, Moore incorrectly identified her as Nayes. He also mentioned a Mary Rumph, which as I have just learned from Don Ecsedy was her maiden name. This, is, of course, disturbing. 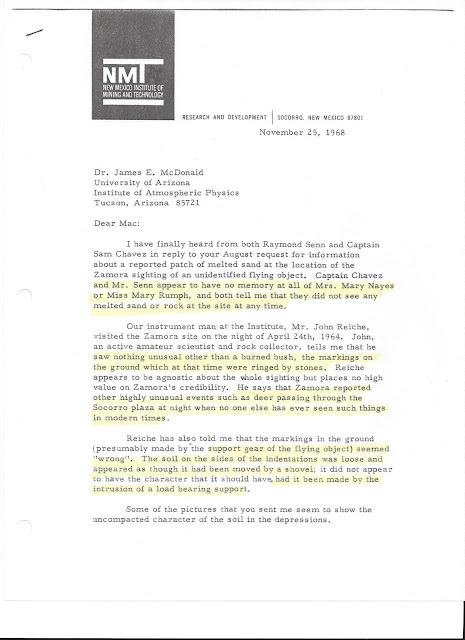 It suggests something about Zamora that had not been mentioned by anyone else over the years, and while this letter, from Moore to McDonald has been available to researchers for a long, it seems that information from it had been overlooked. One of the landing pad impressions found by Zamora. Photo courtesy USAF. Which is another bit of information that hasn’t seen much in the way of publicity. While it seems that Reiche doesn’t care about any agenda, only the truth, it is also clear that he has raised some questions about Zamora and about the landing gear traces. I haven’t seen much like this in the research that I had conducted until now. But I will note that some of that loose dirt seemed to be explained by the landing gear sliding in the dirt as the weight was applied to the landing pad and the dirt shifted under the added weight. We now have evidence that suggests Mayes’ tale might not be true. 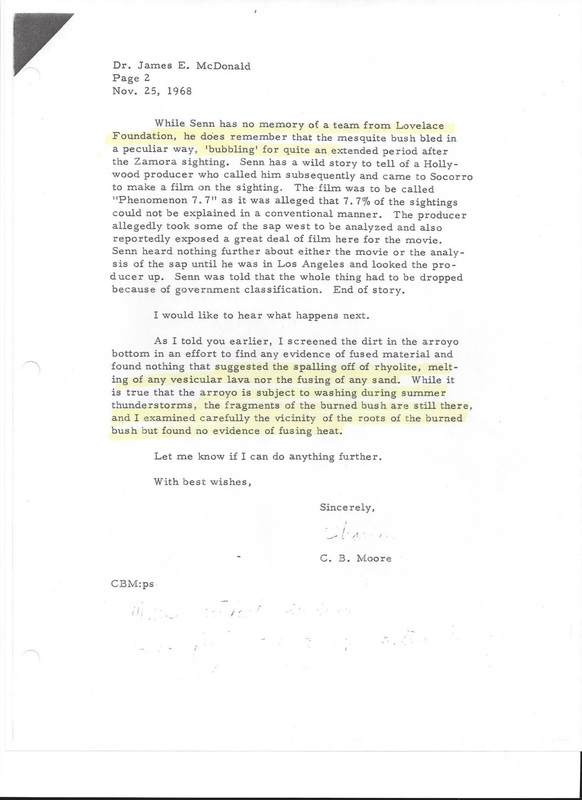 Although Moore called her Nayes in his letter, it would seem that if Senn heard the name Nayes, he would have mentioned that he knew someone named Mayes. Instead, he denied knowing her. She [Mayes/White] seemed to be quite astonished that Senn said he did not know her, and she said not only had her family known him for many years, but she, herself, had “stood up for him” at his wedding… I had frankly tended to dismiss her story on the basis of what you’d turned up and Senn’s not knowing her. She again went very briefly over it - - where the fused sand lay relative to the impression, etc. No signs of evasive coverup or backtracking to mend her story. And reexpressed surprise at Senn’s saying he didn’t know her. I pointed out that Reiche saw nothing like that when he was there, and she seemed genuinely puzzled. Don Ecsedy tells me that there was a fellow namd Rumpf at Senn's wedding and is mentioned on the documentation available on line. So it seems possible that Mayes was at the wedding but that Senn knew her as Mary Rumpf rather than Mary Mayes. But I also have to wonder why, when McDonald asked her about this, she didn't mention that she was Mary Rumpf at the time. It would have cleared up this one point of disagreement and that she didn't seems curious. 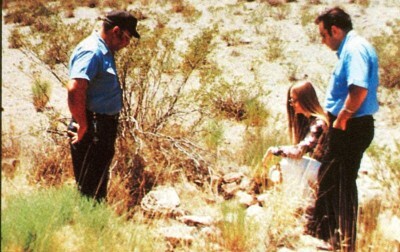 Although this picture has been published suggesting it is Mary Mayes on the scene, this photograph was staged some time later with Zamora looking on. police from White Sands cordon the area, take measurements and preserve the scene. Although it is not clear if the MPs were there overnight, but next day, there were any number of people on the scene, but no one mentioned Mayes and her colleagues being there. They would have needed some guidance to find the right place, so they would have had to come into contact with the Socorro police or the government officials (Holder and FBI Agent Byrnes). Photographs, taken the evening of the 24th and at other times give no hint of the melted sand, and those taking samples, from the damaged bush, from the soil around the landing area, and from other parts of the arroyo have nothing to suggest a high heat that would melt the sand. Here's something else. According to Stanford, when he was on the site with Hynek and Zamora, he, Zamora, spotted a rock with what looked like metal scrapings on it. He pointed it out, but it seemed that no one cared about these possible metal sample from an alien spacecraft. 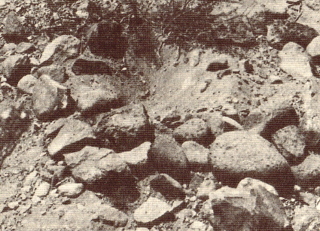 Once the site was cleared, sometime that afternoon, Stanford returned and retrieved the rock and its metallic samples. This does not seem to be the same rock that was near the melted sand that Mayes mentioned and that Zamora seemed to confirm existed some two years later but I wonder if Zamora wasn’t confused by the disappearance of the rock taken by Stanford. Zamora, and others, thought that the Air Force had retrieved the melted sand sometime later and that it was taken to a secret lab for analysis. Again, there is no testimony anywhere in the Blue Book files to confirm that this melted sand existed or that there was any analysis done of it. There are, in the documents I now have, a suggestion that Holder had written a five-page report, but I have not located it yet. To recap what we’ve learned here. Mayes told Friedman about the melted sand some two years after the landing and that she had analyzed it. Friedman passed the information to McDonald, who followed up on it. Mayes said she was at the scene the next day, April 25, but that seems to be unlikely given the statements of others. At any rate, she claimed to have found an area of melted sand near the burned bush and recovered it, taking it to her lab for analysis. Once that was completed, the Air Force arrived, confiscated all the material and her notes, and told her not to talk about it. She had nothing to prove any of this, though there are those who accept the story without question. 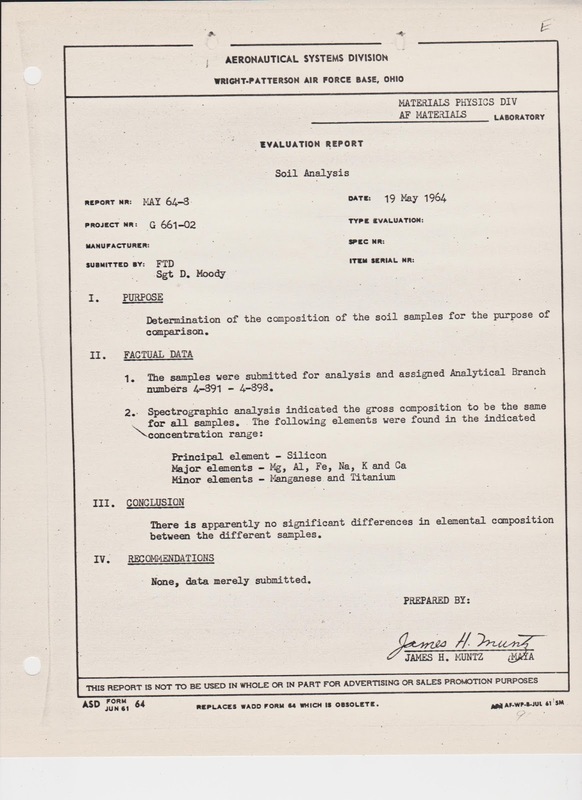 Apparently, no one who was on the site on the evening of April 24th, who examined the burned bush carefully, who studied the landing gear impressions, and made measurements, noticed the area of melted sand near the bush and therefore none reported it. Other examinations of the site, in the months and years to follow found no evidence of heat high enough to fuse the sand, or any other indications of fused sand. It would seem, if we accept Mayes as telling the truth, that she collected the entirety of this evidence. Overall, this might be as far as we can take this, which is farther than I thought we could get. I have a couple of inquiries out that might pay off, but then again, we are pursuing something that is now over half a century old. Time might just be the one hurtle that we are unable to leap. I have found the new season of The Curse of Oak Island to be a crashing bore. I haven’t posted much about it because I keep falling asleep in the episodes. I have tired of the artificial crisis of the week, the over the top claims and the failure to really find anything of significance no matter how many times they tell us they have found something of significance. You all must remember that in the first minutes of the first episode they came to the washed-out road and wondered if they had lost the whole season because the road provided the only dry land access to the important locations on the island. Of course, they repaired the road and we all knew that was going to happen. If they couldn’t repair it, we’d have had a one hour special rather than the opening of the season. Look what has happened since. Well, the government, either in Nova Scotia or the Canadian government, was going to shut down the operation. They feared, apparently, for the archaeological integrity of the island. Without a trained archaeologist on site, they weren’t going to allow the search for the treasure to continue. I wondered if the archaeological integrity hadn’t been compromised sometime in the last 220 years. Everyone one and his brother or sister (yes, my hyperbole) has been digging on the island. It would seem that anything that might have had any significance had already been destroyed, moved, broken, discarded, hidden or completely compromised. But, of course, they found a suitable archaeologist who was approved by the governmental agencies and is now another person who has begun to fed at the trough known as Oak Island. Oh, don’t misunderstand. I’m sure the man is highly qualified and knows what he’s doing, but I’m not sure that he is all that important. This whole program, meaning The Cures of Oak Island, is so important to Nova Scotia that they’re not going to stop the production. Millions of dollars are at stake, millions have been brought into the local economy and people are coming for tours of the island and tales of the treasure. Of course the government is not going to shut the thing down and stop the floor of dollars. So, what have they found this season? Well, Rick, who was suffering from Lyme Disease, another of the problems over blown this season (and, again, don’t get me wrong, the disease is serious), but Marty showed up to tell him they had found the Money Pit. It sounded like a dramatic announcement It had been teased in the trailers for the season. Now they were close to the treasure, but all it really meant was that Marty believed they had found the original hole dug back in 1795. Didn’t mean there was any treasure to be found, only that they had found, well, an old hole, which meant very little in the overall picture. The guys with the metal detectors, who seem to be doing the most important work here, found the barrel of a gun. Before the commercial break, we got a glimpse of it, and by the sight on that barrel, it was clear to me that it had been modeled after the Colt Peacemaker, first produced in 1873, which meant its relevance was limited. Back from commercial and we learn that it was the barrel from a cap pistol made in the 1950s, so the relevance is further reduced. It might have belonged to Ricky Restall, youngest son of Robert Restall. For those who don’t know, Restall and his oldest son, Robert, Jr., died on Oak Island in a tragic accident that took two other lives, Karl Graeser and Cyril Hiltz. Just to recap this tragic tale, Robert Restall had arrived on the island in the late 1950s sure that he could find the treasure. He brought his family with him and they spent their summers in their effort to recover what had been buried in the Money Pit. On August 17, 1965, about two in the afternoon, Restall told his wife, Mildred, that he had to go into town. He’d work for another hour or so and then return to clean up for the trip. Restall, climbing down into shaft that he had been working in that day, fell into about four feet of water that had collected on the floor of the shaft. His older son, saw his father lying in the water and began to climb down to help him. He too lost consciousness and fell into the water. Moments later, Graeser, one of Restall’s backers and a marina operator from Long Island, arrived, saw the trouble and climbed down to assist. Behind him was 16-year-old Cyril Hiltz. Both of them lost consciousness and fell into the shaft. The final person to fall into the water was 17-year-old Andy DeMont. By now there were calls for assistance and a group of tourists on the island, including a fire fighter, Edward White, ran to help. White apparently realized there was some sort of gas in the shaft. White tied a rope around his waist, and had others lower him into the shaft. He was able to pull the unconscious DeMont out of the water, but White was beginning to lose consciousness as well. He tried to find the others but failed. DeMont, and White were pulled out and given artificial respiration, regaining consciousness. The other four did not survive. The autopsy suggested they had all died by drowning, which, given the circumstances, makes some sense. They all fell, unconscious, into about four feet of water. This didn’t stop others, over the years, from attempting to find the treasure. Of course, all those attempts have failed, but none seem to have been as well financed and equipped as that begun by the Laginas boys. They keep digging and drilling and finding little bit of this and a piece of that. These have been promoted with great fanfare, but mean little to the overall solution. A bit or two of pottery, found far below the surface, seemed to suggest something to the Laginas and others, though I’m not sure what. Had the land been undisturbed, had there not been two centuries of people digging up that one end of the island, it might have been significant, but without some sort of context, it seems, to me, to mean little. When we get right down to it, and which is the reason that I haven’t posted much of anything about this season is because it mirrors the last few seasons. Discoveries touted as important, but really, in the end mean little. The pieces of the cap gun were returned to Rick Restall, and seeing him and his sister certainly put faces on some of the tragedy of the island. And, we have learned a great deal about the history of the island, but nothing that gets us any closer to the treasure. *I know that some of those celebrity net worth pages are completely wrong. I don’t know how they obtain the figures but it seems to be guess work at best. The other day I was interviewed by Whitley Strieber for his radio show/podcast about my book, Encounter in the Desert. I mentioned the book just because I could and hope that some of you will be inspired to buy it. something that has happened before… Friedman getting credit for something he hadn’t done, and yes, I can provide other examples). Naturally, he asked how I had learned of Exon, and I explained that J. Bond Johnson had mentioned the name to me and I had tracked him down, calling him in 1990. But, that got me to thinking about all this and I went back to my notes and files about the interviews with Exon. 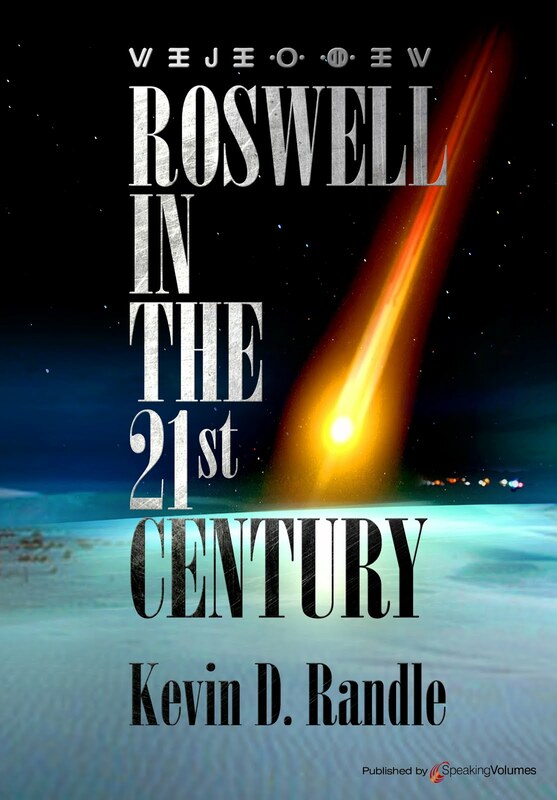 For those who don’t know, I had called him, but rather than mention Roswell, I said that I was interested in tracking some of the information about ATIC and Project Blue Book, retrieval operations or four separate incidents, figuring that once we got into the topic of UFOs, we could expand from that. And that was the first mention of Roswell in the conversation. Exon said that he didn’t know him all that well but did say that he had his telephone number. I already had that as well. Yes, I know what you all are thinking but that interview took place on May 19, 1990, before we all learned the truth about Johnson and his ever-shifting story. At the time I knew that Johnson held a commission and was a colonel in the Reserve. I hadn’t really thought about this in a long time, and in 1990, I didn’t realize the importance of the statement. And, to be fair, I did provide copies of the transcript to several people including Philip Klass, Karl Pflock, Don Schmitt and Tom Carey. One page was missing from that I had sent Klass, and I replaced it. The point is that these people, and probably a couple more have had this information almost from the time that I collected it. 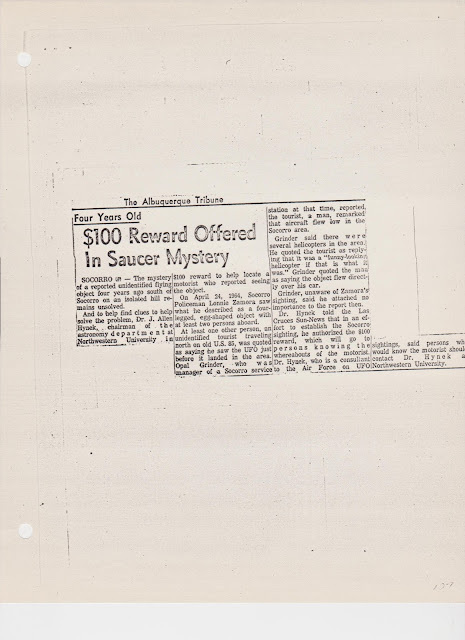 Had the Air Force, during their investigation contacted me about Roswell, I would have sent them copies of the tape. In fact, I offered copies of a number of the taped interviews to them, but they seem uninterested in them. I always thought it was because they didn’t want to have to attack the reputation of a general officer. Had they taken the tapes, they would have had all this information as well. The other thing here is that Exon was right about knowing one of the photographers who took pictures of the residue. Johnson did take them and it was from Johnson that I got Exon’s name. 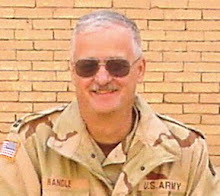 I shared that information with Stan Friedman when were both in Roswell to film the segment of Unsolved Mysteries that dealt with Roswell. What is the take away here? But I’ll bet my skeptical pals will suggest this is another reason that we should not place any emphasis on Exon’s statements. This is another example of how jumbled his memories were nearly a half century after the fact. We have talked about the possibility of a hoax in the Socorro UFO landing case. We have, or at least I have, thought that the idea of a student hoax has been rejected as implausible. There were way too many moving parts that required way too many unpredictable actions to be a reasonable scenario. From the very beginning, it required Lonnie Zamora to react in a way the students needed him to react so that he would find his way to the location of the landing. Hynek seemed to be indicating that Zamora, on his own, couldn’t have pulled this off. He would have needed help which is suggestive of a conspiracy involving at least one other. 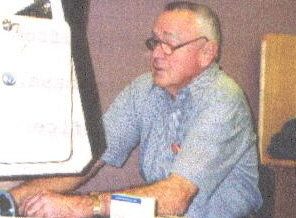 Philip Klass thought that it was the mayor of Socorro who had a financial motive and the intelligence to set this up. Research by others, including Paul Harden, proved that this was not the case. But then I got to thinking about it. The hoax scenarios, as they have been developed over the years, are way too complex. They involve balloons, which should have been recognized as such, several different people who left no trace of their presence at the landing site, and no way for them to escape before the arrival of others on the scene to spot them. 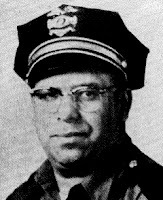 Sergeant Sam Chavez of the New Mexico State Police arrived within three minutes of receiving the call from Zamora but, unfortunately not long after the craft had disappeared. All this presupposes that Zamora related, accurately, what he had seen. It presupposes that he didn’t embellish in any way, and it presupposes he wasn’t clever enough to have pulled it off, just as Hynek suggested. Let’s look at this from, well, a different perspective. things, and some of the arguments about the alien nature of the craft and its capabilities are no longer relevant. The whole thing becomes much simpler to explain in terrestrial terms. Going back, and looking specifically at the descriptions of the landing marks, it seems that the various witnesses talked mostly about how the soil had been scraped to one side or the other. That seemed to indicate that something heavy had set down, but in the process, as the weight was applied, the landing pads shifted slightly. It didn’t seem as if they had been scraped out in the way it would look if a shovel had been used but more as if it was the result of something having landed there. One of the landing pad traces. 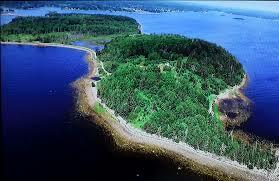 But we have to remember here that those nine people only saw the landing impressions and the burned vegetation. There might have some embellishment simply because it seems that no one really saw the bush smoking after the craft took off. Oh, it seems to have been reported that steam or smoke was rising from that bush by Chavez, but it is one of those things that is hard to pin down in the world today. Although many rejected the idea that Zamora had created the hoax on his own for some unknown reason, the Zamora hoax explanation is by far the simplest. It eliminates the need for a balloon either hot air or helium filled, it eliminates the need for other participants to create the illusion of something landing there, and it explains the lack of physical evidence that the hoax scenario should have left behind. If Zamora had done it, he just needed his shovel and a tape measure. Then he called the station to make his report and request that Chavez come out to meet with him. This also explains why none of those other people who said they had seen something ever came forward. All the rest of it, from the alien creatures, the banging of the hatch, the red symbol… all of it was so much window dressing created by Zamora. And while that theory is applauded for its simplicity, it fails when other facts are figured into it. We can begin with the three telephone calls into the police station. Again, we know little about them, we don’t know who made them, but they are documented in the records gathered that night and in the report filed by Richard Holder. It would mean that, at the very least, one other person had to be involved. He or she could have made the three telephone calls though it is more likely to have been three people. It would have involved Opal Grinder who said that he had talked to the tourists from Colorado who mentioned the low flying aircraft. That adds another person to the conspiracy which is, of course, another person to spill the beans on this unless, of course, Grinder was the one who made the telephone calls to the police. And one thing that might argue the loudest against Zamora doing it on his own was that the impressions on the ground, when corrected for the terrain features are symmetrical and the burned bush seemed to be located at the precise center where you would expect the rocket or jet used to lift it would be situated. That seems to be much too sophisticated for Zamora to have pulled off. It is one of those things that he might have lucked into, but it does seem to argue against a Zamora alone hoax. I’m not a fan of the Zamora hoaxed the sighting without any real motivation and no real inspiration. 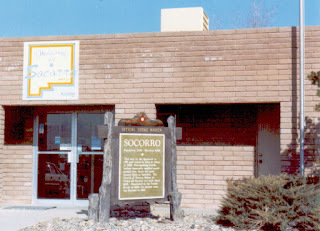 Again, Hynek mentioned there had been no UFO sightings reported around Socorro prior to Zamora’s sighting, but afterwards, there were many (some of which were hoaxes). The sightings for April 1964 from other parts of the world are fairly mundane and didn’t receive much in the way of publicity if any at all. Had Zamora’s sighting come in the middle of the wave, it might be that these other reports suggested the idea to him. I like this idea, that Zamora hoaxed it by himself because of the simplicity of it. However, when we add in other factors, all the factors, it seems that the theory is flawed. Hector Quintanilla suggested the solution for the case would probably be found in Zamora’s head, and had he hoaxed the thing, then Quintanilla had it right. But Zamora never suggested to anyone that he had made up the story, his friends and his actions that night seem to argue against hoax, and there is no real motivation for him to have created the hoax that included the landing site. *I had thought that "hoaxster" was a proper name for someone who had created a hoax... I just liked the sound of it better. But, after a number of people suggested that the word was not correct, I tried to look it up in my whopping, huge dictionary, but it wasn't there. So, I corrected it. Socorro Solution - A Hoax?